The Band of the Hour rehearses at the IM Fields in preparation for Hurricane football games. File photo. Every Monday, Wednesday and Friday afternoon during fall semester, trumpets sounded and drums thumped to the tunes of UM alumna Gloria Estefan and her band, the Miami Sound Machine. The intramural fields were not the go-to rehearsal space for Estefan and her entourage. It was the Frost Band of the Hour (FBOTH), the university’s celebrated marching band. FBOTH created its 2016 football season halftime shows around Estefan’s discography, and Estefan attended the UM vs. Florida State University halftime show. This fall, the band will be playing an arrangement of Kanye West songs. It’s an unlikely choice for a marching band, but Director of Athletic Bands Jay C. Rees said that’s exactly the point. “You’re just reaching so many different kinds of people that we have an opportunity and, therefore, a responsibility to push the envelope,” said Rees, who is entering his fourth year as director. One of UM’s oldest student organizations – dating back to 1933 – FBOTH has increased its membership every year since Rees became director. Almost 40 percent of its 140 members are music majors, which is the largest percentage of music majors of any Division I college marching band, school officials said. The band is funded by the Frost School of Music, but anyone can join, whether they are a Frost student or have musical experience. For Max Rosenfeld, a senior mechanical engineering major who plays the trombone, the band gave him lifelong friends and motivation. “It gave me goals to work toward, both personal goals and team goals, and a sense of pride when we accomplished anything,” Rosenfeld said. Rees said the band plays a special role as a spirit organization. “We all want to have such a great connection to our undergraduate institution, and this is a way to really feel connected to the greater university,” he said. Being a student in the FBOTH comes with some perks. Members earn credit, and it counts toward a cognate for non-music majors and toward major requirements in the Frost School of Music. Travel and eating expenses are covered, and FBOTH students also receive a $1,500 stipend each year. Rees said he believes playing in the band teaches responsibility and time and stress management skills, which help students balance other commitments. Gray Kafkes, an FBOTH trumpet player for three years, has learned the art of balancing. He is an executive board member for campus programming organization Category 5, a brother of Phi Mu Alpha fraternity, a co-founder of the Hellenic Student Association and a member of Doulos, Orthodox Christian Fellowship and the National Association for Music Education. Kafkes was in his high school band and said when he joined the FBOTH, his social network grew instantly. Though FBOTH occasionally travels with the UM football team and plays during bowl games, it also performs at homecoming, parades and ribbon-cutting events. In the past few years, the band has traveled all over the country, from El Paso, to San Francisco, Louisville and Brooklyn. 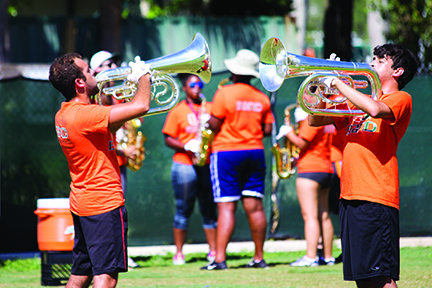 While band camp is already underway for this fall, students interested in joining can fill out the registration form at bandofthehour.org/join and reach out to the directors at band@miami.edu.